Use it with default settings on EURUSD M30. Imperium Pattern EA is a fully automated expert Advisor with secure stop loss level, so your funds are always protected. Ready to work without prior configuration. 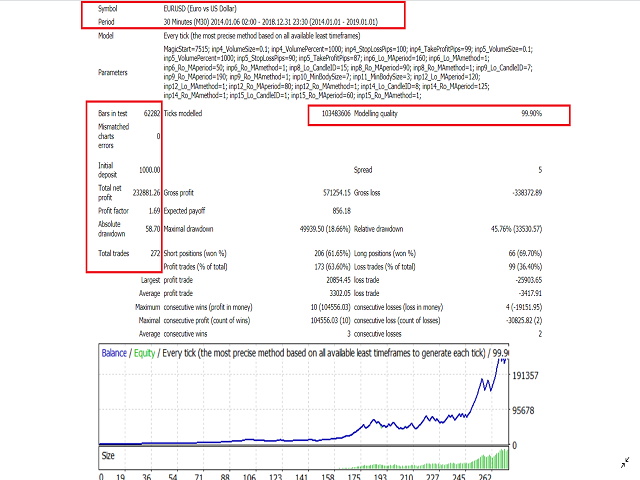 auto lot based on account equity. It works with three, four and five-digit quotes. Secure with fixed stop loss on each trade. With 26 fully optimizable parameters for custom needs. It trades based on custom developed special candlestick patterns and 4 moving averages with fully optimized parameters to find the sweet spot to open trade. Every trade has stop loss and it DOES NOT USE Dangerous systems like the Grid, martingale and other risky strategies. So, just lean back let he EA work and enjoy profits. If you are using backtest data with lower precision than 99.9%, then the results may vary. backtest with accurate data if you can for best results! Default settings are optimized for EURUSD M30.